Ruthiebear (Titusville, NJ, United States) on 23 December 2013 in Lifestyle & Culture and Portfolio. The green color and multicolored balloon decorations are reminiscent of the summer, which we already have in six months. Very nice set up. I like the frozen look in the background. Gorgeous photo! Great colours and DOF. It's a wonderful picture with excellent clarity on the ornament, superb colors and excellent light, DOF and composition. Stunning capture of the ornament in beautiful colors. I like the excellent DOF. What wonderful isolation and realism you have managed here - I feel I can reach in and touch ! wow, v cool use of DoF - the ornament is so clear and vibrant. It looks very cold where you are! Well seen - delightful ornament and beautiful shining colours. lovely shot Ruthie, I'm surprised the ice didn't smash it. Very beautiful composition ! Splendid photo !! Beautiful color for an outside ornament ... I hope it is unbreakable! great color and light on the ornament! A great composition for Christmas, beautiful. A pretty ornament with excellent lighting. Nice job of shooting. wow...fantastic shot . . .
Superbe boule verte qui pend quelle couleur originale et ce dessin sur la boule sueprbe. Fabulous shot Ruthie! Happy Holidays and wishing you a happy & healthy new year. Gorgeous light and color and great DOF! This is just beautiful Ruthie! A fantastic image! Just perfect, a white Christmas for you all. 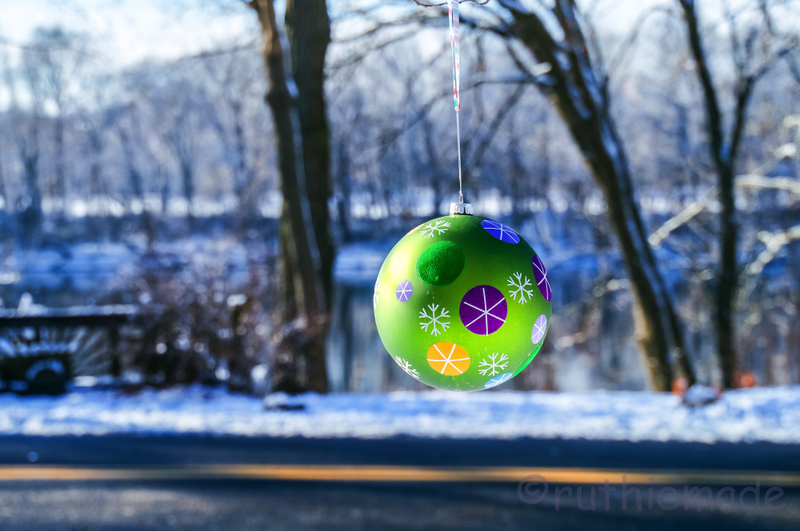 Beautifully colored ornament and perfect setting for it in this winter scene! Great photo! Fantastic light and a beautiful composition. Merry Christmas! with beautiful composition, focus, colors, lighting & bokeh! Beautiful ball, and a very successful image :-)) Haleja. Happy Monday evening ,my good friend Ruthie! I love how you photographed the ornament!!!! Check out my photo tomorrow (for the 24th). Lovely light, colors, and snowy background. A lovely piece to put out there!!! So very beautiful - I love it ! Cynthia and I viewed many of you past works recently, wonderful work Ruthie. I really like the depth of field in this one. The ornament is interesting outdoors.